I respect Instagram for limiting the live links I can put in my bio but I need some space to spread my wings, ya know?! So this page is for all the stuff I want to tell you if you are coming from my Instagram. Thanks for coming over, by the way! Have you joined? If not, please do! You can unsubscribe anytime, but membership has it’s privileges! The form is HERE. These are all the rage right now. I take one for the team and review the popular ones so you can get the scoop before spending your hard earned cash! Go HERE for a peek inside the boxes I’ve reviewed. I have my work (quilt-y goodness) and creative products (e-books and other creative biz tools!) for sale at my Etsy shop. Go HERE to lay down some cheddar for all the things you’re coveting on my Instagram. My courses are HERE. Register for free (you’ll automatically be subscribed to the C+M Friends List) and then browse the course catalog for creative and mindful learning opportunities. By me! Ya know when you want something really specific but you can’t find it? That was the deal with Dot Party. 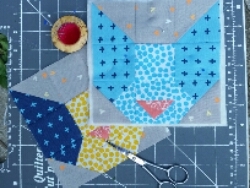 I wanted certain colors in 1/4″ dots but struck out at every LQS and online quilt shop. So I made my own!